Product information "Karamalz Fresh Lemon Malt drink - alcohol free 20x0,5l - Original box"
Karamalz Fresh Lemon - lemon fresh! Karamalz Fresh Lemon is a non-alcoholic mixed drink of malt beverage and lemon lemonade. It combines the unique taste of the caramel malt of Karamalz Classic with the aroma of sun-drenched citrus fruits. The citrus fruits provide a healthy portion of vitamin C and make Karamalz Fresh Lemon a fruity-sparkling taste experience. Like Karamalz Classic, it is lactose-free, vegan and self-evident without any genetically modified ingredients. Karamalz Fresh Lemon tastes just as well chilled best. "Karamalz Fresh Lemon - the classic maltdrink with the taste of sun-drenched citrus fruits for a fruity-sparkling taste experience." 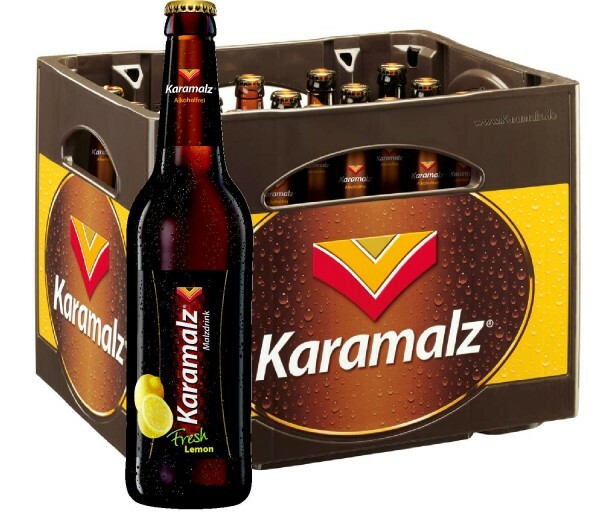 Related links to "Karamalz Fresh Lemon Malt drink - alcohol free 20x0,5l - Original box"
Customer evaluation for "Karamalz Fresh Lemon Malt drink - alcohol free 20x0,5l - Original box"